In his wonderful book, Rabbit is Rich, John Updike offers the following observation: ‘Laugh at ministers all you want, they have the words we need to hear, the ones the dead have spoken’. Here Updike is suggesting that religious language, the Bible’s language, or what he calls ‘the words … the dead have spoken’ are the very bread and butter of a minister’s vocabulary, words which determine not only the content of a minister’s speech but also the conduct associated with a minister’s speech. Indeed, ministers are permitted to speak only that which has been given. All other words are only waffle, a foul and unholy wind. No wonder that Bonhoeffer said that ‘teaching about Christ begins in silence’. For the words which the dead have spoken are, as Walter Brueggemann reminds us in his book on the psalms, ‘words that linger with power and authority after their speakers have gone’. Brueggemann understands the psalmists and prophets to be the great poets of our tradition, who speak to God out of the fullness of the human condition. He considers the entire psalter as a collection of three kinds of psalms: there are psalms of orientation, psalms of disorientation, and psalms of new orientation. ‘Poets exist so that the dead may vote’, said Elie Wiesel, and they vote in the Psalms. 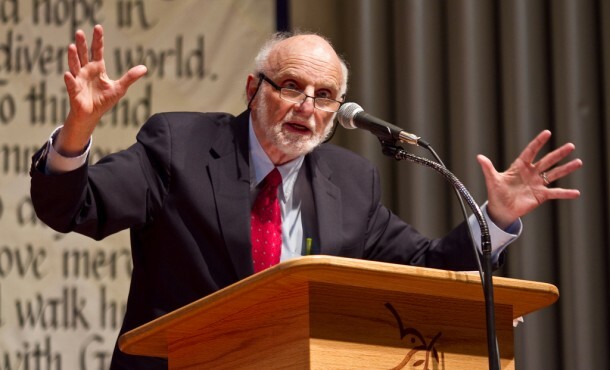 ‘They vote for faith’, says Brueggemann. ‘But in voting for faith they vote for candor, for pain, for passion – and finally for joy. Their persistent voting gives us a word that turns out to be the word of life’. Brueggemann is concerned about the kind of exclusively happy-clappy churchianity that exists, saying that ‘the problem with a hymnody that focuses on equilibrium, coherence, and symmetry (as in the psalms of orientation) is that it may deceive and cover over. Life is not like that. Life is so savagely marked by incoherence, a loss of balance, and unrelieved asymmetry’. True poets, painters, musicians etc. take the fullness of creaturely life seriously and, insofar as they do this, open up space in which the Holy Dove of God has room to flutter her wings. The contemporary American church is so largely enculturated to the American ethos of consumerism that it has little power to believe or to act. This enculturation is in some way true across the spectrum of church life, both liberal and conservative. It may not be a new situation, but it is one that seems especially urgent and pressing at the present time. That enculturation is true not only of the institution of the church but also of us as persons. Our consciousness has been claimed by false fields of perception and idolatrous systems of language and rhetoric. The internal cause of such enculturation is our loss of identity through the abandonment of the faith tradition. Our consumer culture is organized against history. There is a depreciation of memory and a ridicule of hope, which means everything must be held in the now, either an urgent now or an eternal now. Either way, a community rooted in energizing memories and summoned by radical hopes is a curiosity and a threat in such a culture. When we suffer from amnesia every form of serious authority for faith is in question, and we live unauthorized lives of faith and practice unauthorized ministries. The church will not have power to act or believe until it recovers its tradition of faith and permits that tradition to be the primal way out of enculturation. This is not a cry for traditionalism but rather a judgment that the church has no business more pressing than the reappropriation of its memory in its full power and authenticity. And that is true among liberals who are too chic to remember and conservatives who have overlaid the faith memory with all kinds of hedges that smack of scientism and Enlightenment. … The task of prophetic ministry is to nurture, nourish, and evoke a consciousness and perception alternative to the consciousness and perception of the dominant culture around us … So, my programmatic urging is that every act of a minister who would be prophetic is part of a way of evoking, forming, and reforming an alternative community. And this applies to every facet and every practice of ministry. It is a measure of our enculturation that the various acts of ministry (for example, counseling, administration, even liturgy) have taken on lives and functions of their own rather than being seen as elements of the one prophetic ministry of formation and reformation of alternative community … [I]f the church is to be faithful it must be formed and ordered from the inside of its experience and confession and not by borrowing from sources external to its own life. So in calling upon preachers to take seriously the role of the imagination, Brueggemann is not asking us to discard our own tradition and to take on something new. Rather, he is inviting us to do what God’s prophets and apostles have always done – to hear and to see and to taste and to touch and to speak the word of God, and to do so with all the powers of new imaginings that God has given to us, even in our own tradition, so that we might wrestle with the Word of God, with the old old story, as if for the first time, and have our lives formed by it. The gospel is too readily heard and taken for granted, as though it contained no unsettling news and no unwelcome threat. What began as news in the gospel is easily assumed, slotted, and conveniently dismissed. We depart having heard, but without noticing the urge to transformation that is not readily compatible with our comfortable believing that asks little and receives less. The gospel is thus a truth widely held, but a truth greatly reduced. It is a truth that has been flattened, trivialized, and rendered inane. Partly, the gospel is simply an old habit among us, neither valued nor questioned. But more than that, our technical way of thinking reduces mystery to problem, transforms assurance into certitude, revises quality into quantity, and so takes the categories of biblical faith and represents them in manageable shapes. When truth is mediated in such positivistic, ideological, and therefore partisan ways, humaneness wavers, the prospect for humanness, is at risk, and unchecked brutality makes its appearance. We shall not be the community we hope to be if our primary communications are in modes of utilitarian technology and managed, conformed values. The issues facing the church and its preachers may be put this way: Is there another way to speak? Is there another voice to be voiced? Is there an alternative universe of discourse to be practiced that will struggle with the truth in ways unreduced? In the sermon – and in the life of the church, more generally, I propose – we are to practice another way of communication that makes another shaping of life possible; unembarrassed about another rationality, not anxious about accommodating the reason of this age. The task and possibility of preaching is to open out the good news of the gospel with alternative modes of speech – speech that is dramatic, artistic, capable of inviting persons to join in another conversation, free of the reason of technique, unencumbered by ontologies that grow abstract, unembarrassed about concreteness. Such speech, when heard in freedom, assaults imagination and pushes out the presumed world in which most of us are trapped. Reduced speech leads to reduced lives. Sunday morning is the practice of a counter life through counter speech. The church on Sunday morning, or whenever it engages in its odd speech, may be the last place left in our society for imaginative speech that permits people to enter into new worlds of faith and to participate in joyous, obedient life. To address the issue of a truth greatly reduced requires us to be poets that speak against a prose world. The terms of that phrase are readily misunderstood. By prose I refer to a world that is organized in settled formulae, so that even pastoral prayers and love letters sound like memos. By poetry, I do not mean rhyme, rhythm, or meter, but language that moves like Bob Gibson’s fast ball, that jumps at the right moment, that breaks open old worlds with surprise, abrasion, and pace. Poetic speech is the only proclamation worth doing in a situation of reductionism, the only proclamation, I submit, that is worthy of the name preaching. Such preaching is not moral instruction or problem solving or doctrinal clarification. It is not good advice, nor is it romantic caressing, nor is it a soothing good humor. It is, rather, the ready, steady, surprising proposal that the real world in which God invites us to live is not the one made available by the rulers of this age. The preacher has an awesome opportunity to offer an evangelical world: an existence shaped by the news of the gospel. This offer requires special care for words, because the baptized community awaits speech in order to be a faithful people. What a way to think about a poetic occasion that moves powerfully to expose the prose reductions around us as false! … Because we live so close to the biblical text, we often fail to note its generative power to summon and evoke new life. Broadly construed, the language of the biblical text is prophetic: it anticipates and summons realities that live beyond the conventions of our day-to-day, take-for-granted world. The Bible is our firm guarantee that in a world of technological naivete and ideological reductionism, prophetic construals of another world are still possible, still worth doing, still longingly received by those who live at the edge of despair, resignation, and conformity. Our preferred language is to call such speech prophetic, but we might also term it poetic. Those whom the ancient Israelites called prophets, the equally ancient Greeks called poets. The poet/prophet is a voice that shatters settled reality and evokes new possibility in the listening assembly. Preaching continues that dangerous, indispensable habit of speech. The poetic speech of text and of sermon is a prophetic construal of a world beyond the one taken for granted … This poetic/prophetic utterance runs great risk. It runs the risk of being heard as fantasy and falsehood … The more tightly we hold to settled reality, the more likely the alternative construal of the poet will be dismissed as ‘mere fiction’. The poet/prophet, however, does not flinch from ‘fiction’, for the alternative envisioned in such speech is a proposal that destabilizes all our settled ‘facts’, and opens the way for transformation and the gift of newness. And so Brueggemann encourages us to think of preaching as ‘a poetic construal of an alternative world’, the purpose of which is to ‘cherish the truth, to open the truth from its pervasive reductionism in our society, to break the fearful rationality that keeps the news from being new … After the engineers, inventors, and scientists, after all such through knowledge, “finally comes the poet”. The poet does not come to have a say until the human community has engaged in its best management. Then perchance comes the Power of poetry – shattering, evocative speech that breaks fixed conclusions and presses us always toward new, dangerous, imaginative possibilities … This speech, entrusted to and practiced by the church, is an act of relentless hope; an argument against the ideological closing of life we unwittingly embrace’. It is precisely this posture towards and way of thinking about the poetic and fantastic (i.e., from fantasy, fiction, etc.) nature of reality and the shape of divine revelation that is just so imperative, not only for preaching but also for prayer, for pastoral encounters, for crafting liturgy, for choreographing church leadership structures and meetings, etc. Surely one of the main roles for leaders of faith communities is to help transform and foster our imaginations with the rich and fundamental traditions and texts that have formed us as a people, and to help God’s people to hear those afresh, as if for the first time. And for leaders of Christian faith communities, this means fostering an imagination baptised in the promises and stories of the Bible, seeing and hearing and tasting them as God’s ever-new speech. And what art encourages is the opening up of hermeneutical space wherein our questions are taken seriously, where we can feel safer to explore them with God and with God’s people. Such a posture is something of a confession too; a confession that (i) there is truth that desires to be known; and (ii) we do not and cannot monopolise and control the truth of things. 1. The first partner in the meeting is the text. The congregation gathers with a vague memory of the text – a memory that has the text mostly reduced, trivialized, and domesticated. The baptized then, have been struggling with this text. The ones gathered are those who have either been other texts and have found them wanting, or have greatly resisted other texts and need this text reiterated Once again. Either way, out of compromise or resistance, the community gathers not for entertainment or private opinion, even for problem solving, but for the text made available yet again. They gather to hear the text that is shamelessly theological, candidly kerygmatic, and naively eschatological. The community waits for the text that may be a tent for the spirit. It waits with the hopeful yearning that the ‘house of authority’ is still intact. But if the text is to claim authority it will require neither the close reasoning of a canon lawyer, nor the precision of a technician, but it will require an artist to render the text in quite fresh ways, so that the text breaks life open among the baptized as it never has before. It is not time for cleverness or novelty. It is not time for advice or scolding or urging, because the text is not any problem-solving answer or a flat, ideological agent that can bring resolve. This moment of speech is a poetic rendering in a community that has come all too often to expect nothing but prose. It is a prose world for all those who must meet payrolls and grade papers and pump gas and fly planes. When the text, too, has been reduced to prose, life becomes so prosaic that there is a dread dullness that besets the human spirit. We become mindless conformists or angry protesters, and there is no health in us. We become so beaten by prose that only poetic articulation has a chance to let us live. Into this situation, in this moment, the preacher must speak. She does not get to speak a new text. She must speak an old text – the one everybody knows. From the very first syllable, the ending is already known. But it is a script to be played afresh, so that in this moment of drama the players render the play as a surprise to permit a fresh hearing, a second opinion. It is an artistic in which the words are concrete but open, close our life but moving out to new angles of reality. At the end, there is a breathless waiting: stunned, not sure we have reached the end. Then there is a powerful sense that a world has been rendered in which I may live, a world that is truly home but from which I have been alienated. The speaker must truly be a poet. After the scientist and the engineer, ‘finally comes the poet’ (which Israel calls prophet) – to evoke a different world, a new song, a fresh move, a new identity, a resolve about ethics, a being at home. A probe behind the closed parameters of religion too-long settled and politics too easily comfortable. It is not only truth disclosed, but it is life disclosed. Life unclosed, Life made open, certitudes broken so that we can redecide, images moving, imagination assaulting ideology. We find new configurations of life yet unformed, unthought, but now available. The old slogans sound unconvincing. I thought I had come for certitude, but the poetic speech does not give certitude. As I am addressed by the gospel, I hear anew that possibility overwhelms necessity in my life. The only available absolute given me is a ‘fiction’ to which I must trust myself – a gracious ‘fiction’ on which I stake my life, authored by God who also authors the text and the speech. The congregation departs. Same old quarrels in the car on the way home. Same old tensions at dinner. Same tired beginning on Monday. Now, however, there is disclosed a new word, a new hope, a new verb, a new conversation, a new risk, a new possibility. It is not a new truth, but rather one long known that had been greatly reduced. That long-known truth is now greatly enhanced in riches, texture, availability, demand. My life is mapped in mystery and I accept that new life; but it is also mapped in vulnerability and it frightens me. The mystery gives regal authority and freedom in the face of an IRS audit. The vulnerability permits me to come out from behind my desk, my stethoscope, my uniform, my competence, my credentials, my fears – to meet life a little more boldly. Yet again, as the word is spoken one more time, we move through the wearisome death-ridden days of our life and come back once again to Easter to be stunned into disbelief, and then beyond disbelief, to be stunned to life, now filled with fear and trembling. The meeting involves this old text, the spent congregation believing but impoverished, the artist of new possibility, the disclosure. The Prince of Darkness tries frantically to keep the world closed so that we can be administered. The Prince has such powerful allies in this age. Against such enormous odds, however, there is the working of this feeble, inscrutable, unshackled moment of sermon. Sometimes the Prince will win the day and there is no new thing uttered or heard. Sometimes, however, the sermon will have its say and the truth looms large – larger than the text or the voice or the folk had any reason to expect. When that happens, the world is set loose toward healing. The sermon for such a time shames the Prince and we become yet again more nearly human. The Author of the text laughs in delight, the way that Author has laughed only at creation and at Easter, but laughs again when the sermon carries the day against the prose of the Dark Prince who wants no new poetry in the region he thinks he governs. Where the poetry is sounded, the Prince knows a little of the territory has been lost to its true Ruler. The newly claimed territory becomes a new home of freedom, justice, peace, and abiding joy. This happens when the poet comes, when the poet speaks, when the preacher comes as poet. Updike, Bonhoeffer, Brueggemann. You have outdone yourself! Great post. I consider the prose of John Donne to be poetry and nowhere more so than in his Devotions Upon Emergent Occasions which were written during a serious illness in 1623. His sermons aren’t half bad either. Oh Lordy, how I adore Brueggemann…. I lent my copy to someone a few months ago; this is a good reminder to order another one, as the lender loved it as much as I did, and quietly refuses to return it.